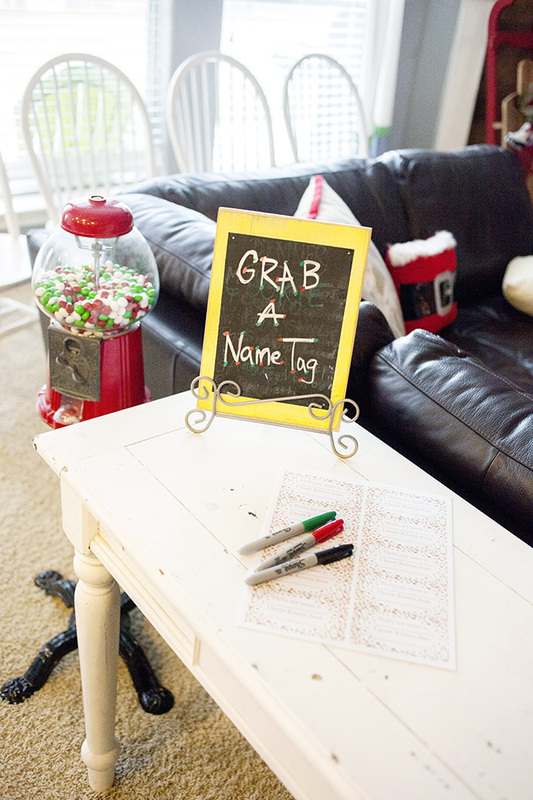 I’m happy to share my Christmas Party Ideas today, just a few details of the gathering, and how it came together. 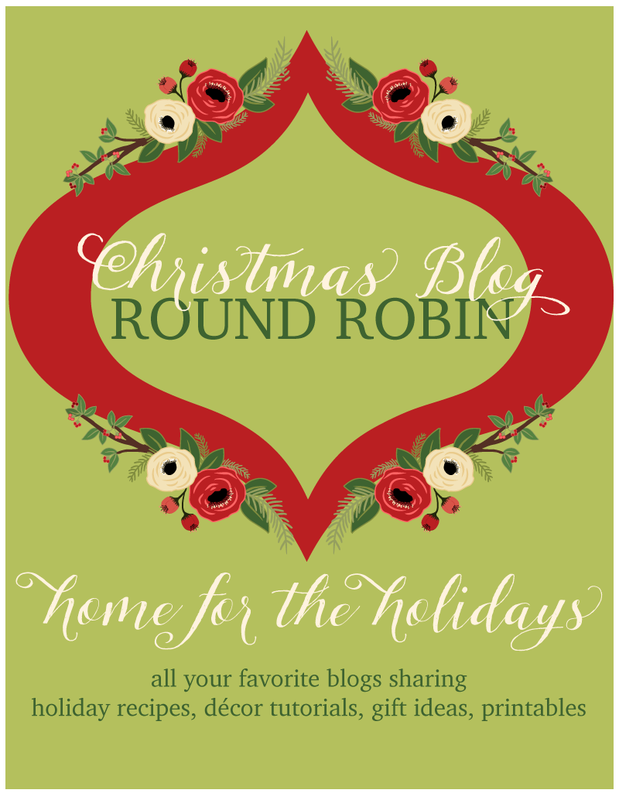 Also, I’m part of a Christmas Blog Round Robin today, where 15 creative friends all posted something fun and Christmas-y, and you can do a full circle of checking out what they shared by visited The Crafted Sparrow next, and seeing who to follow after that from there. 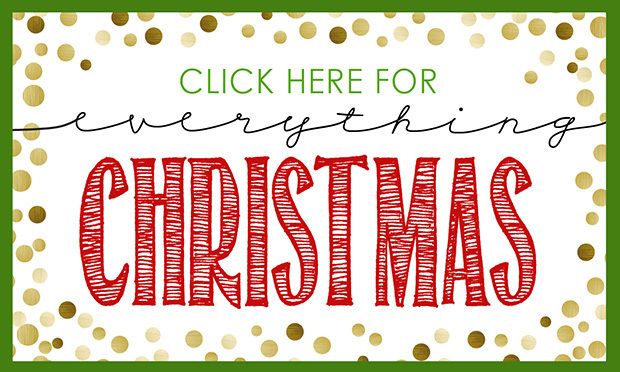 It’s just a fun way to visit a few sites that I’m connected with, and see a variety of Christmas fun! I hosted it the first week of December, so I had to be quick about getting up my Christmas decorations. 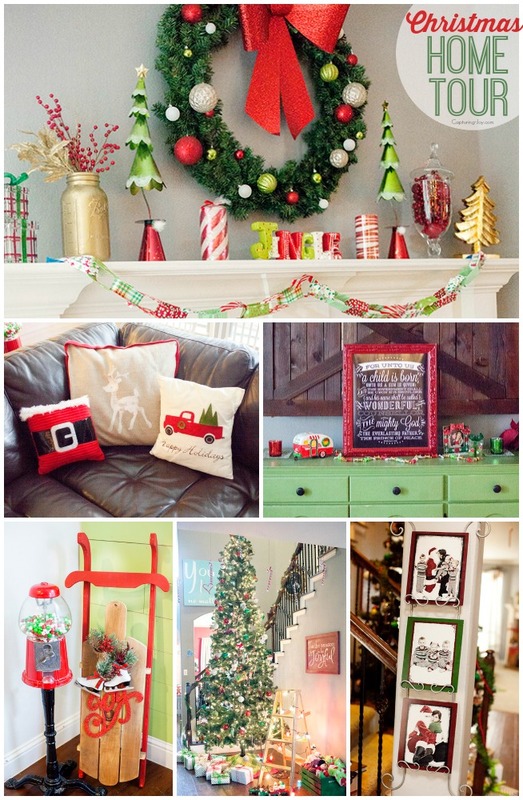 You can see my Christmas Home Tour and my Christmas Mantel more up close on those posts. 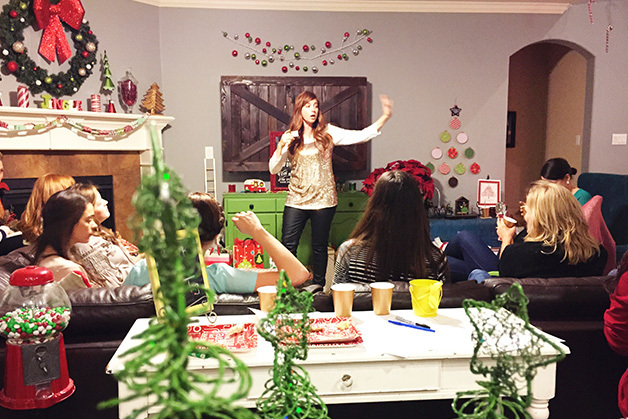 I wrote a bit about the party in my Crazy December post that I gathered my friends from all over the city for a Christmas Party. A lot of them didn’t know each other. Blogger friends, photographer friends, friends from the gym classes I got to, my closest friends at church, ladies in my old church congregation, my kids past school teachers, etc. I think I invited 40, 30 said they could come, and about 25 actually came. 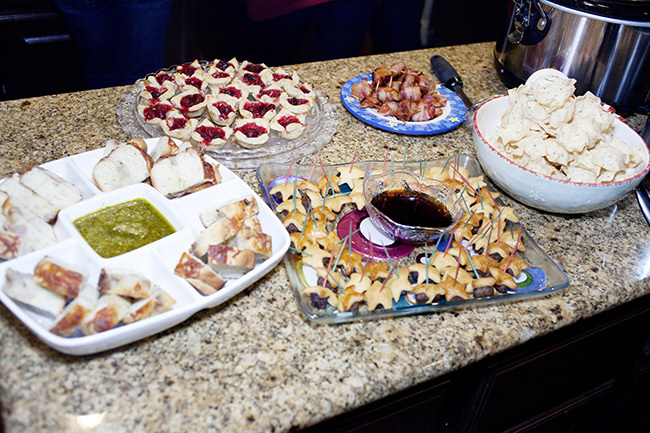 In the invitation, I asked everyone to either bring a sweet or a savory treat to share. 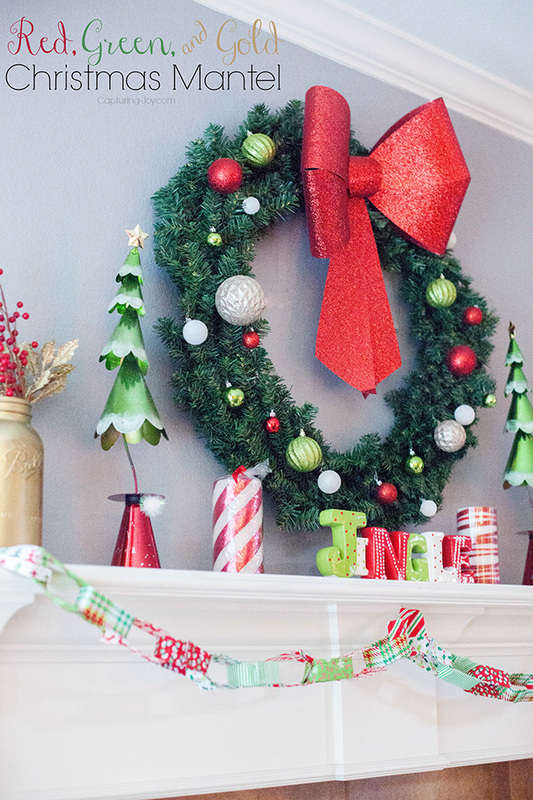 I said they could love over my Christmas Pinterest Board for ideas. I also said we would have a gift exchange, but that it wasn’t the silly white elephant things, but to bring a cute Christmas decoration that you’d enjoy having in your home. I’m not a fan of gag gifts–what do you do with them when you are done? That’s for couples parties with men. I want something CUTE at the end of the day! 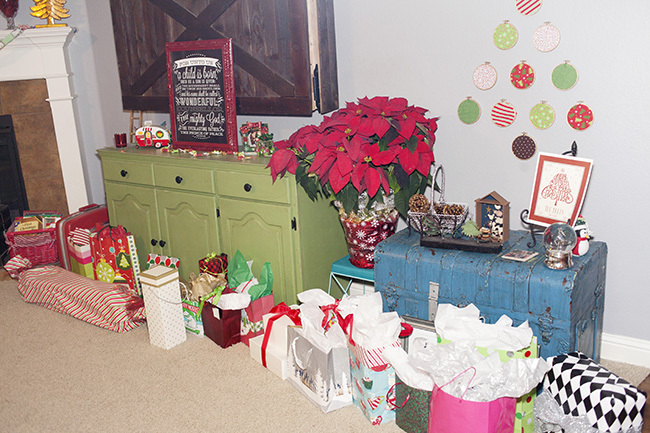 I loved seeing all the presents lined up. I wish I had a picture of all of them opened! Since a lot of my friends didn’t know each other, it was my goal for them to all really get to know each other! I made name tags, and on it, I had a spot to put how they know me. I saw it as a conversation starter. 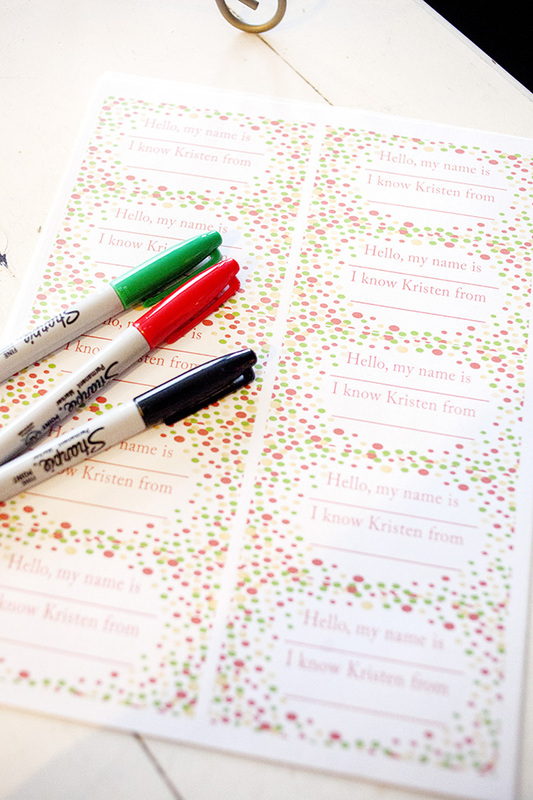 I also had an opening get-to-know-you game, with a list of 20 Christmas related questions, and a space to write a persons name that had done that item. There were some tricky ones! You can right click and save this file if you are interested in it! Do any of these apply to you? For me, they could write my name on: Been to Bethlehem, has gone snow shoeing/cross country skiing. 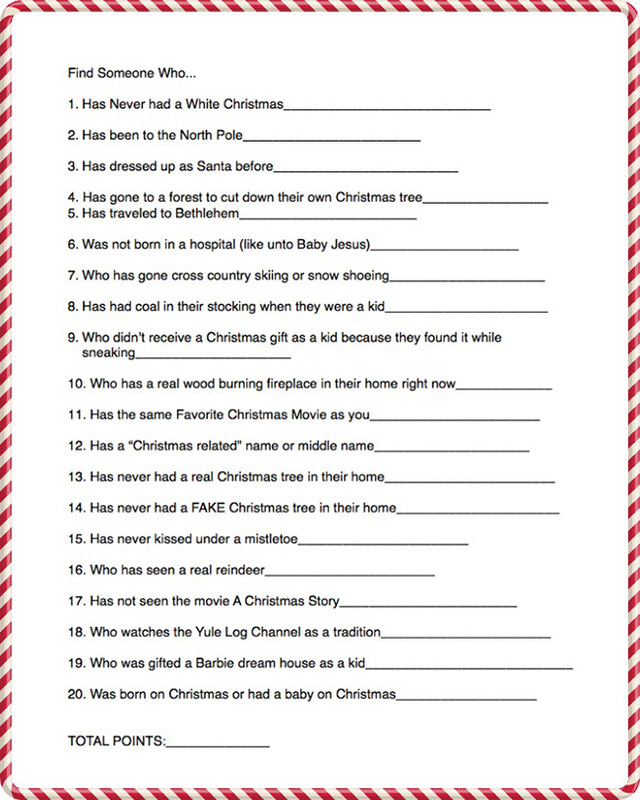 My husband and kids helped me with this random list of questions! 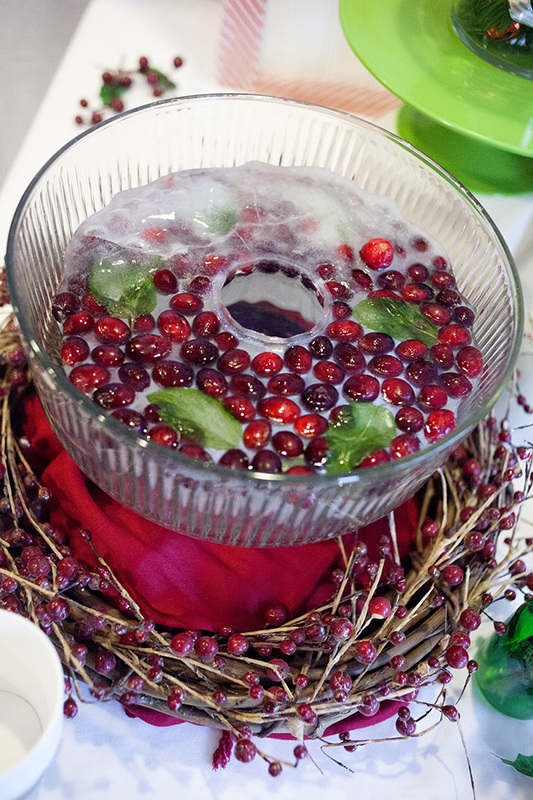 For the party table, I froze some cranberries and mint springs into a bundt pan with water. It made the most fun piece of ice for the punch bowl! I let it sit out for a good hour before placing it in the bowl. 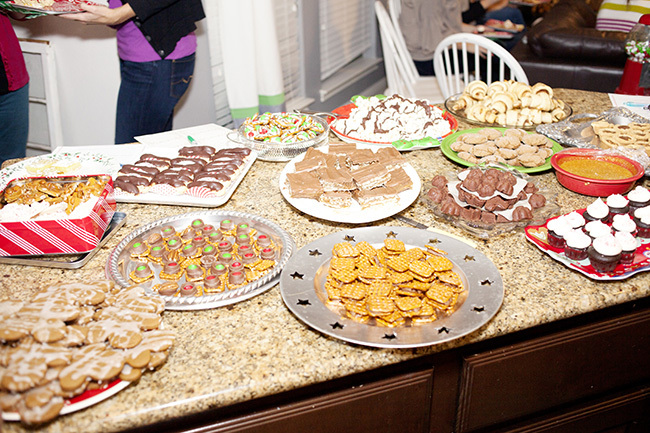 Then, we’ve got the delicious cookies from my favorite vendor, Nanny & Weebs. 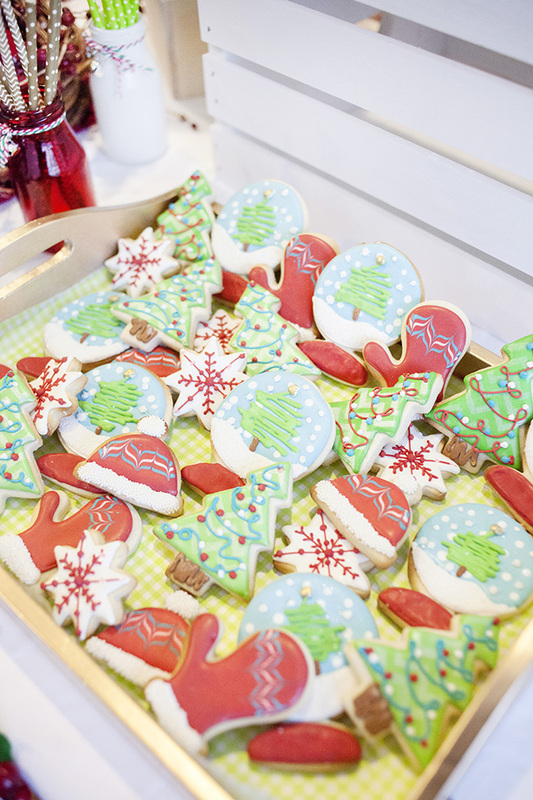 They’ve done cookies now for our Ballerina Party, Neon Skate Party, and Bird & Branch Baby Shower. LOVE their creations! 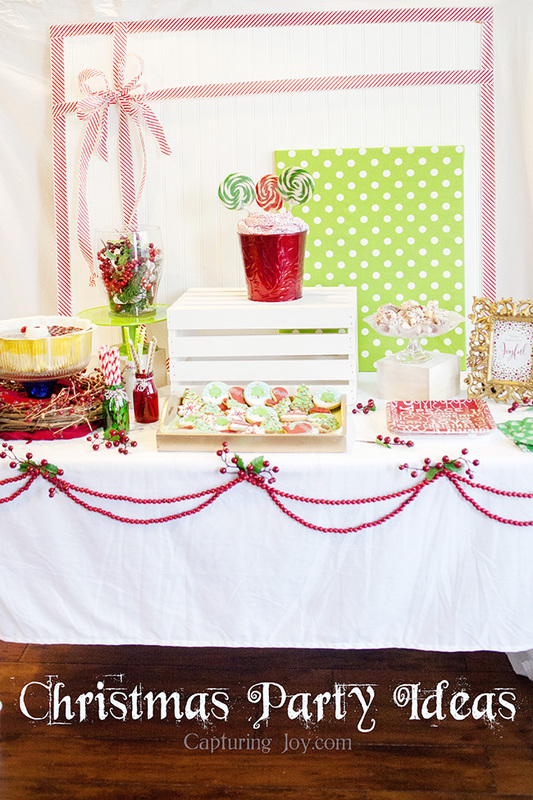 My party table wasn’t the most exciting I have ever created, but I also wasn’t providing a lot of the food. I generally enjoy that creative process, and still did, but I moved my table to a different spot than I normally have it, and put up a white fabric backdrop, and didn’t love how that looked overall. I got this gold frame a few years ago from Marshall’s, this is the first time I filled it, it’s great for a party table! If you see that gold frame, you will see the JOYFUL print I had designed just for the party. I gave everyone a framed print, with a big gold bow on it! 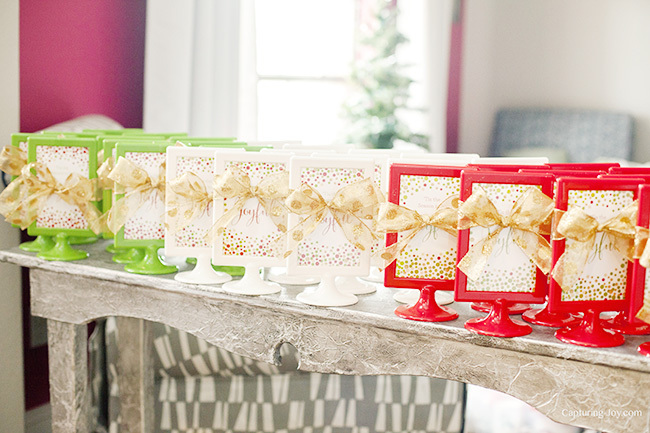 See more about the print, download it in a big or small size, and more on the colorful frames go to the Gold, Green, and Red Joyful Print post. 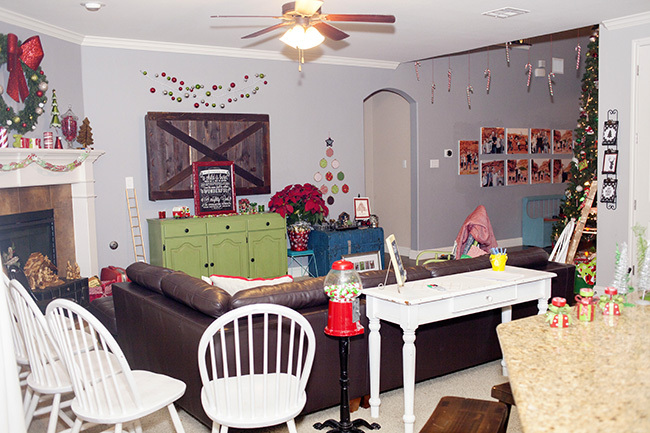 You can see the table in the back of my kitchen with the backdrop–not my favorite look, but I was experimenting, and now I know! Here is what I LOVED–all of the people in my life that I don’t see too often, coming together, and laughing, and enjoying each others company. I stood up at the beginning and said I wanted them to each share how they knew me–a way for others to get to know them, with something concrete to say in an introduction besides, “Ummm, my name is x, I have a few kids, etc.” It turned into a few awkward moments as people were sharing sweet stories of how we came to be friends. I loved hearing it, but felt flushed, too! It really was so heartwarming to see friends make connections with each other, and get to know one another, that was my GOAL! The gift exchange was of course so much fun, as people were stealing gifts, the funniest is when one friend opened this cute white reindeer, and she wanted to keep it so badly that she pretended to nurse it, and that no one could take a baby from it’s mama. Well, someone did, said she could nurse it, too, then ran away, dropped him, and his head fell off! Oh, the laughter! I wish I had picture of all of the happy laughing, but I was enjoying the moment, and will just have to have the memory of it! 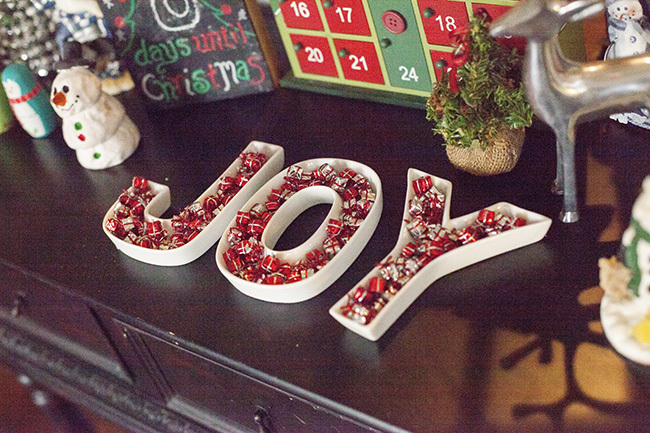 I gifted the “JOY” letters with present confetti to fill it, and kept a set for myself, too. I was stolen a few times, which is always nice to realize you brought something good! 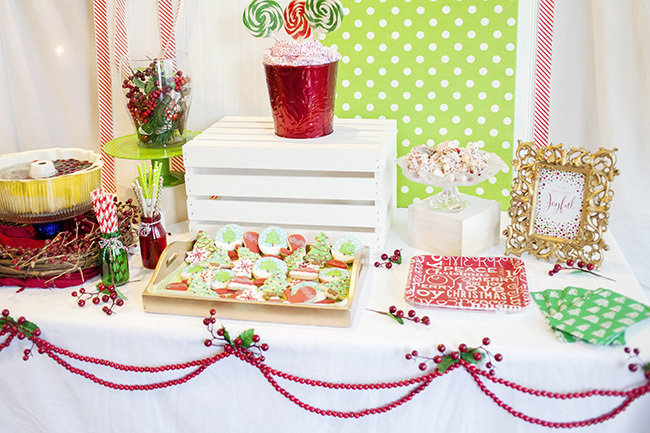 That’s pretty much it for party details! 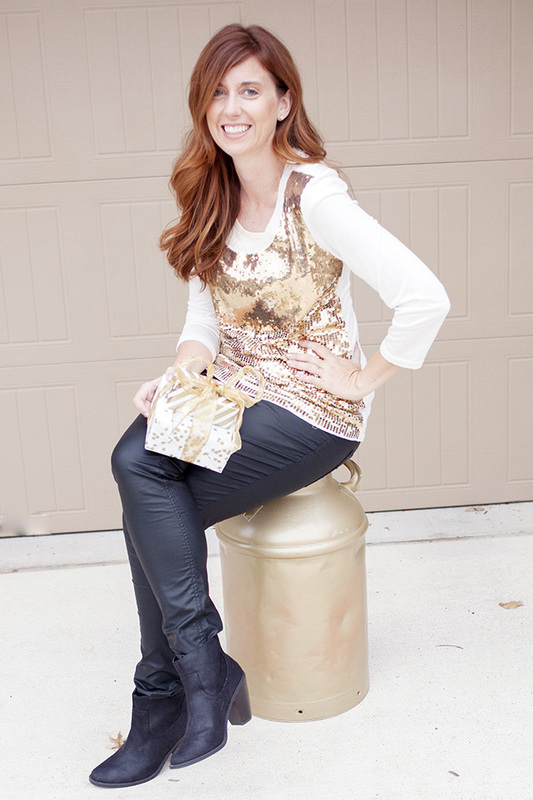 This is how I dressed up for the gathering, I got all fancy in a gold sequin shirt! 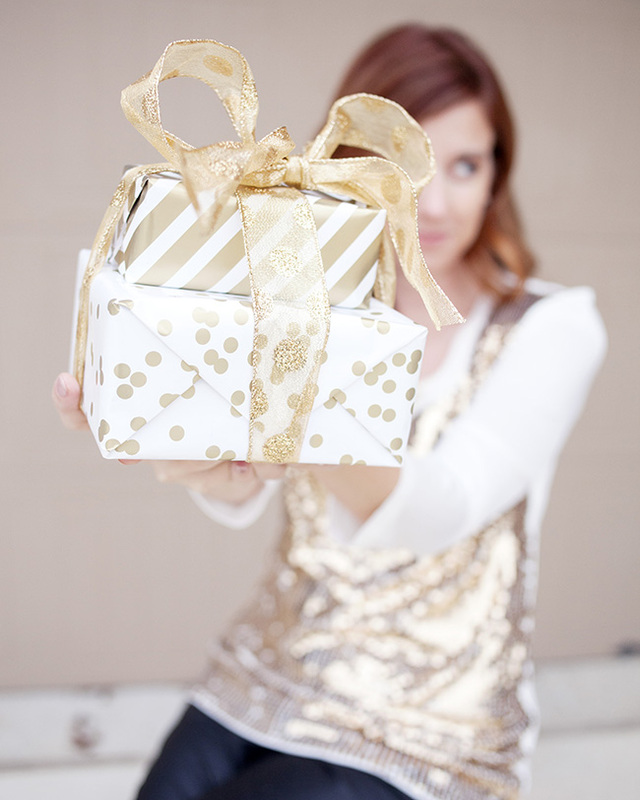 I was also pretty excited about the gold wrapping paper I found at Michael’s. There you have it, my Christmas party in a nutshell! 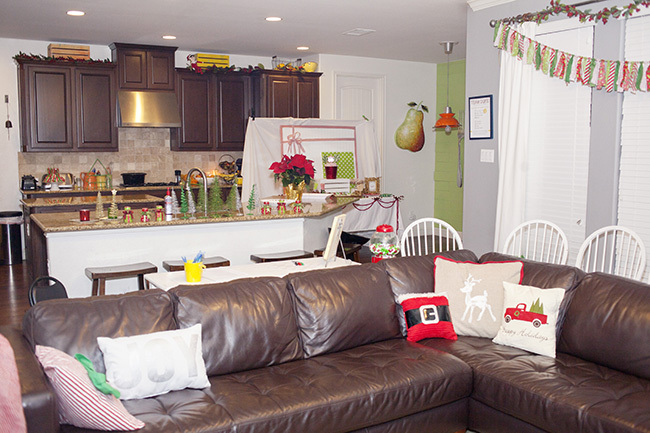 If you’d like to see my full Christmas Home Tour, click on that link, or the image below. 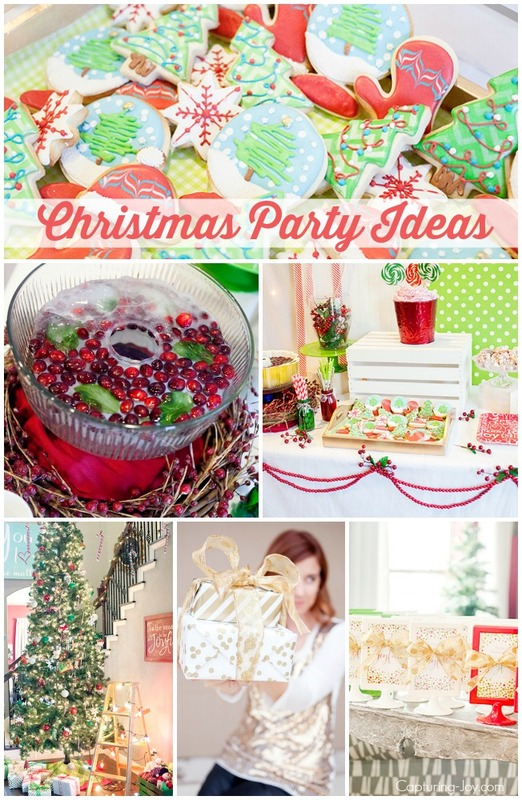 If you want to save any Christmas party ideas for later, or want to share with friends, you can PIN your favorite image, or the collage below! Remember to hop on over to The Crafted Sparrow next and follow the Round Robin all the way around!